The Fig. 517 and Fig. 518 contain any spills that occur at the fill point on Aboveground Storage Tanks. Both are designed to be mounted on top of the AST. The Fig. 517 has a hinged cover that is lockable with a #3 Masterlock. It is of steel construction and powder coated white inside and out. The Fig. 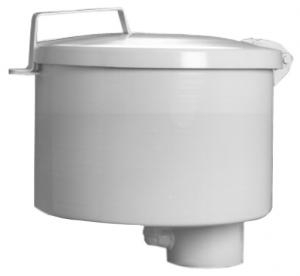 518 Spill Container has a hinged cover that is lockable with a #1 Masterlock. It has a push type drain with a fluoroelastomer o-ring. It is of steel construction and powder coated white inside and out.